The DVT Debugger is an add-on module to the DVT Eclipse IDE. It integrates with all major simulators and provides advanced debugging capabilities. 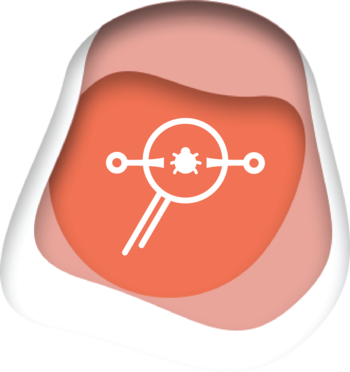 The DVT Debugger is unique because it allows users to perform debugging from the same place where they develop their code. It practically eliminates the need to continuously switch between the editor - to understand the source code, and the simulator - to inspect variable values and set, enable, and disable breakpoints or advance the simulation. Deploying the DVT Debugger requires minimal simulation flow changes. One can launch the simulation in debug mode and specify the DVT communication library using simulator specific arguments. 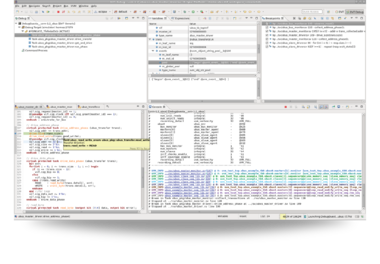 The DVT Eclipse IDE ships with debugger configuration examples that help with deployment. The communication between the DVT Eclipse IDE and simulator is done through network sockets. Users can connect to a simulation running on another machine, for example from a "GUI jobs" machine to a more powerful "batch jobs" machine that executes the simulation. It is also possible to connect from a machine on which the source code is available, to a machine on which the source code is encrypted. The DVT Debug Perspective is a GUI layout focused on debug-specific activities. It provides simulation controls like step over, step into or resume. It also shows the simulation context in the Editor and several dedicated Views. The Breakpoints View enables users to quickly inspect all breakpoints, enable or disable a specific breakpoint or define conditional breakpoints. The Debug View allows users to move up and down the call stack where the simulator stopped. The Debug View and the editor are always synchronized. In the Debug View, when the user moves up and down the call stack, the active line corresponding to the selected stack frame is automatically highlighted. The Variables View displays the variables associated with the stack frame selected in the Debug View such as the arguments of the current function, locally declared variables, class members, and module signals. Users can change a variable value at runtime from this view. The Expression View permits users to define and watch expressions. They can inspect a complex expression by selecting it in the editor, and then adding a watch to the Expressions View. The Console View shows the simulation output and it allows users to enter simulator commands. Double click to add a breakpoint at a specific line in the DVT Eclipse IDE's editor. Whenever the simulator hits a breakpoint, the editor highlights the corresponding line. Hover a variable name to quickly see the runtime value in tooltip. Debug from the same place where you write code. Commonly used debug operations like adding breakpoints, stepping, moving up and down the call stack, or changing values are just a click away in the DVT Eclipse IDE. Avoid unnecessary printing or other additional commands because the run-time context is automatically fetched from the simulator. The call stack and local variables are available to be analyzed anytime the simulator hits a breakpoint. Take advantage of all DVT Eclipse IDE's features that help navigate and understand the code: hyperlinks, hierarchy browsing, finding usages or tracing, and many others.